Since I live downtown, I am pretty central to everything, so I typically walk everywhere. Being able to walk is one of my favorite aspects of living downtown and really what initially sold me. Who knew being able to walk out of my door to Starbucks across the street, one of my favorite Thai restaurants a few blocks away, and PNC Park and Heinz Field across the bridge could be so life-changing?! It totally is. However, if you are at all familiar with Pittsburgh, then you know the suburbs/metro area surrounding the city is super popular, too. A lot of my friends and all of my family live in the surrounding Pittsburgh area which requires me to drive. I'm constantly on-the-go and visiting with friends and family, going to appointments, events, meetings, etc. This requires me to be 'packed' at all times. Typically, I'll grab a giant tote and fill it with whatever I may need for the day if I decide to head out of the city. Or I'll pack it along if I go grocery shopping and that way, I can just carry the one tote up to my floor without having to use a cart! I was recently sent this Barrington Gifts St. Charles Yacht Tote and it might be the most perfect tote ever. Not only is the quality amazing (which is what I always expect with Barrington Gifts), but the look of it is gorgeous, too. 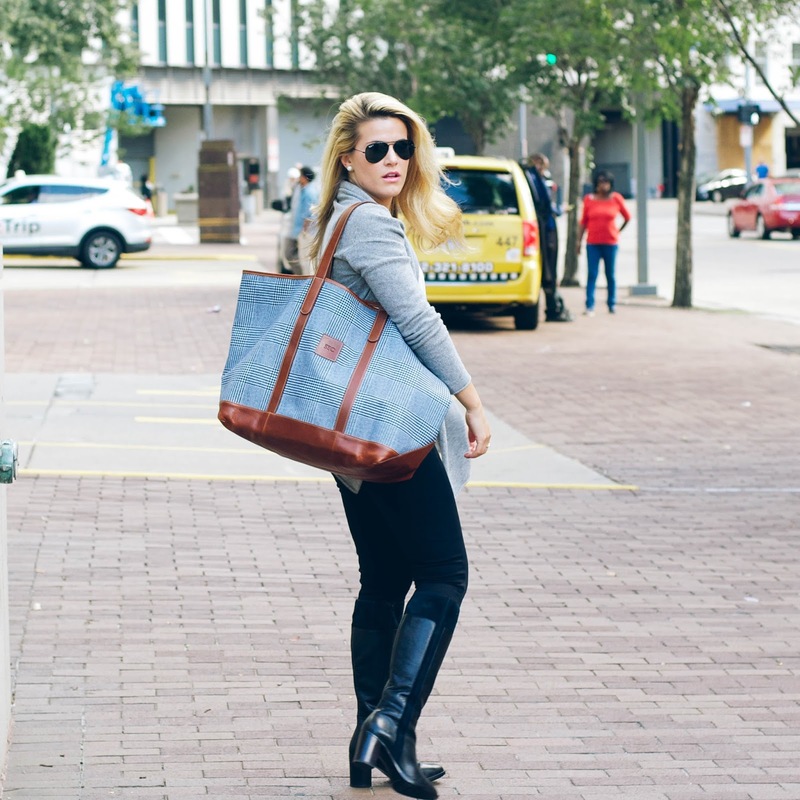 It is so luxe with all of the leather detailing on the handles/base and the print is perfect for fall/winter. 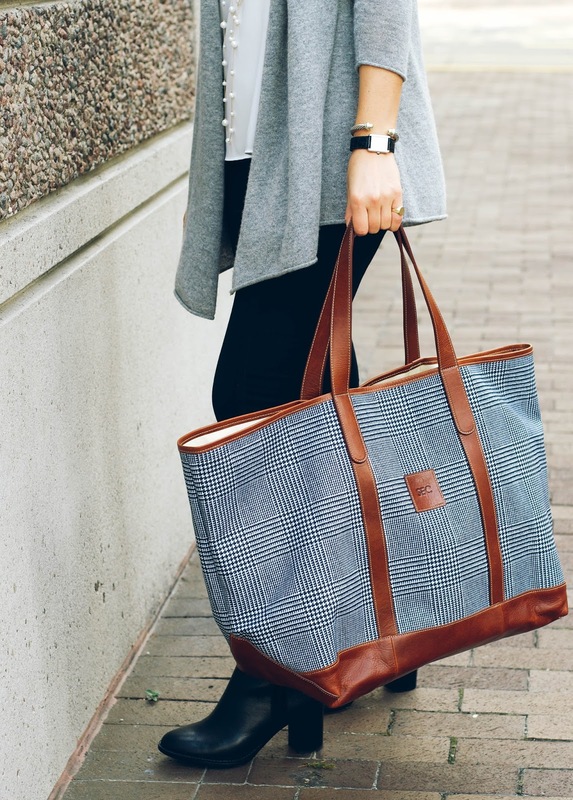 I've been using it for a little while and not only is it a great weekender/overnight bag (because it has so many interior pockets), but it's also a great bag to keep in the car and load up with your dry cleaning or groceries (or whatever else you may use it for)! With the holidays coming up (they are coming sooner than we think), it would make a great gift for a college student who travels back and forth a lot or tailgates often. I could have really used this when I was in college! Besides the bag, this entire outfit is something I wear all. the. time. I got this cashmere cardigan last year and have since bought all three colors. It's my go-to during the colder months and even something I'll bring with me in the summer in case of a cool night. I also love wearing it around the house with a nightgown-- it acts as a luxe robe! The leggings are something I have several pairs of. I've been a fan for years and always buy a new pair each season. They're so thick and stretchy that they have the comfort of a legging but you can definitely get away with wearing them as pants if need be! And lastly, I had been searching for tall black boots FOREVER. Seriously, it's hard to find a gorgeous pair of boots at an affordable price and I am so glad I found these Naturalizer boots. Not only are they comfortable and high quality, but they're really stunning (even better in person!). They're leather but they also have suede detailing which really gives the boots depth and texture. I could not recommend them more! I always go a half size up in boots. I got an 8.5 in these and they fit perfectly! 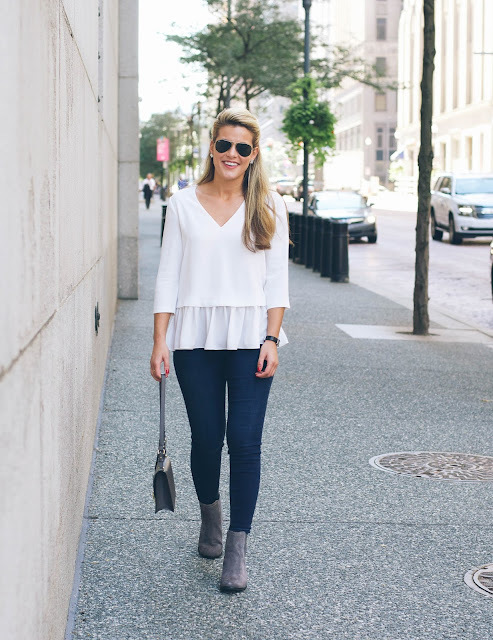 Wearing: So many of you were loving this super comfy $68 pullover when I posted it! I have received a lot of questions, so I'll have a full post on it. But for now, it runs slightly small, I'm wearing a size small. Definitely comparable to a Patagonia style fleece pullover and I love it! Eating: Trader Joe's chocolate mousse pumpkins. I'm warning you-- these are not healthy but INSANELY delicious. 6 come in a package and I literally eat them all within a few days. They're adorable and mini sized, so they are just the right amount of chocolate for an after dinner treat! Reading: All about Snapchat Spectacles. I can't decide if I think it's an amazing idea or not, but I think it'd be fun to try them out! Pittsburgh-ing: The Liberty bridge is now open. WOOOO! Wanting: So many great sweaters and plaid things out right now-- all my favorites!! Drinking: I had my parents and aunt and uncle and Grammie over for dinner a few weeks ago and tried this Louis Jadot Chardonnay! It was very good, light, and refreshing. 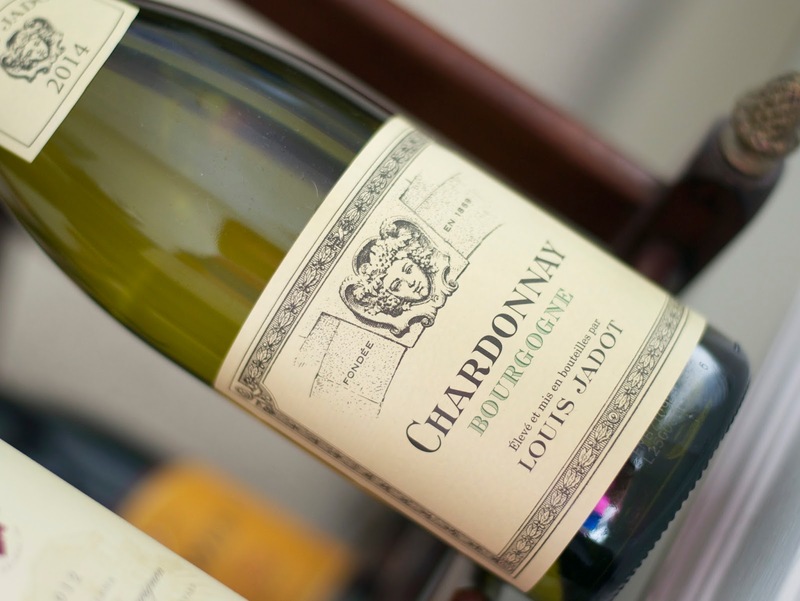 If you're looking for an affordable bottle and are a chardonnay fan, definitely check this out! Sale-ing: I don't typically love the KS Surprise sale, but there are some great things this time around. I'm eyeing this gorgeous navy bag! Listening: I just started on my October playlist and there's only one song so far, so I'll embed it in next week's post! You can find September's playlist, here. Watching: An almost 3-minute trailer has just been released for Fantastic Beasts and Where to Find Them! I cannot wait for November! Quoting: 'Life starts all over again when it gets crisp in the fall.' - F. Scott Fitzgerald// See more of my favorites here. I want to get up and dance around because it FINALLY FEELS LIKE FALL. We have had gorgeous weather here in Pittsburgh. It's been about 65-70 degrees and beautifully sunny-- what could be better?! I switched over my closets from spring/summer to fall/winter and I just love seeing all the pieces in my closet that I forgot about! I also love pulling out all of my boots and booties! The newest pair I've added to my closet are these Hush Puppies Landa Nellie booties in grey suede. I love grey... is it weird if that's one of my favorite colors? 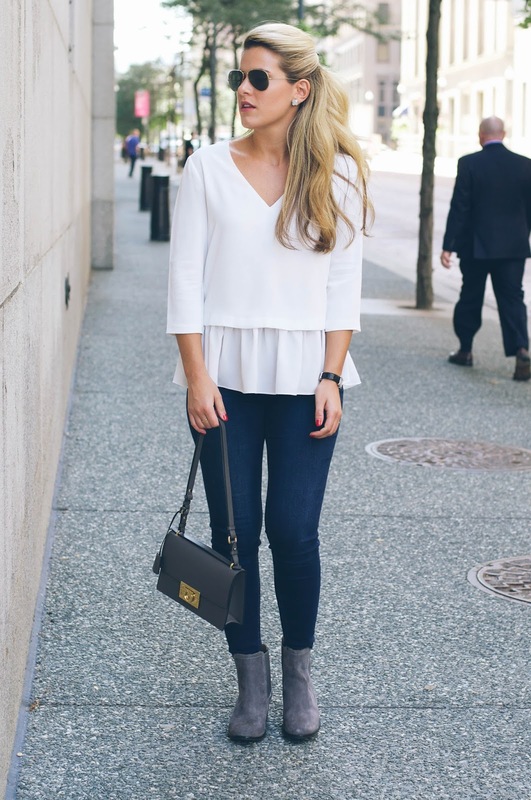 I love that the neutral hue pairs nicely with both navy and black-- two colors I wear very often in the fall/winter. You last saw me in these booties, here. They're amazing, especially for Pittsburgh because of the water resistant suede and gripped soles. I also think they're amazing for those who commute to work because they're so comfortable and weather resistant! Chic and functional! The jeans I am wearing in today's post are the same ones from yesterday's post. You guys, I am obsessed. They are just as nice and fit just as well as my favorite True Religion pairs. But the real show stopper in the outfit is the ruffle hemmed blouse. It's too cute, right?! I saw it online and immediately added it to my cart without hesitation. 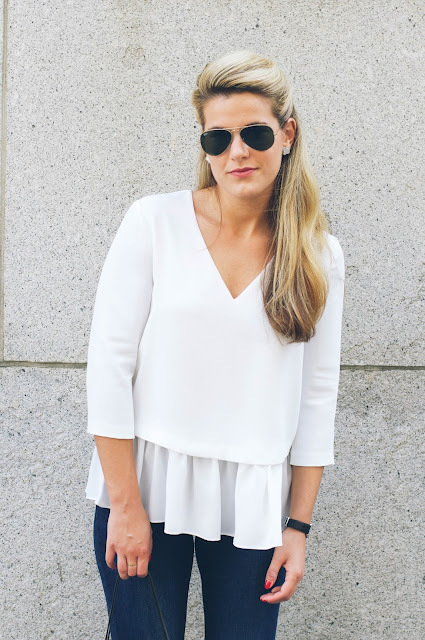 It's feminine and flirty but very put together at the same time... it's a great updated basic for any woman's closet! It's still too warm to layer up as much as I did in the one photo above, but I wanted to throw on this cardigan and wrap to share how gorgeous they look together! I tried the cardigan on in store and fell in love with the grosgrain ribbon trim and gold buttons. It's a great, comfortable basic in a perfect fall hue. 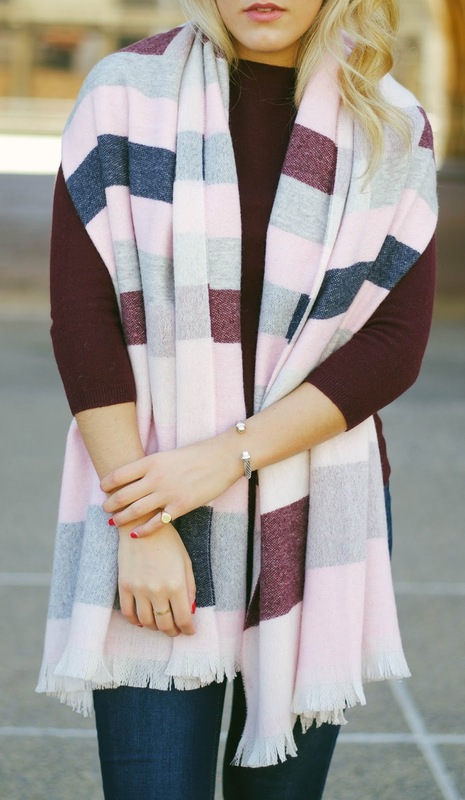 The double-faced wrap is houndstooth on one side and plaid on the other. It paired wonderfully with the burgundy cardigan and the layered look is so cozy and perfect for October (can you believe we are just days away?). It's also under $100, which is a win in my book! I am a Zeta Tau Alpha, and every October when I was in college, we would hold special events and fundraisers to support the ZTA Foundation (which benefitted Breast Cancer Awareness). So not only is this cause something I've been a part of supporting in the past, but it has also affected my grandmother and great aunt, which brings the cause even closer to my heart. This year, Talbots, one of my favorite brands is partnering with the National Breast Cancer Foundation. 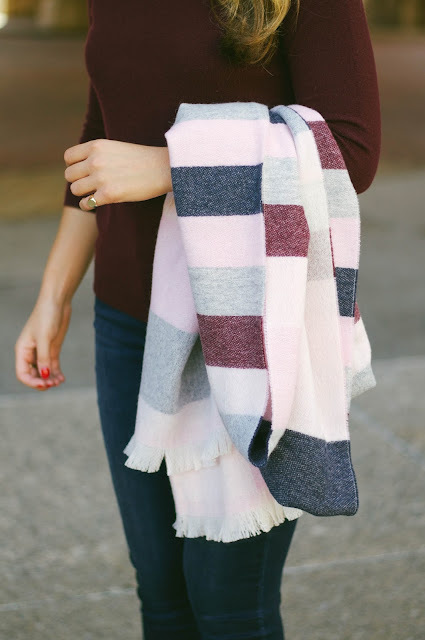 Talbots designed this gorgeous wool blocked stripe blanket wrap of which 20% of net proceeds throughout the month of October, will go to NBCF to provide the tools for early detection and education.The scarf is available in stores and online now through October 31st, so start shopping for a great cause! 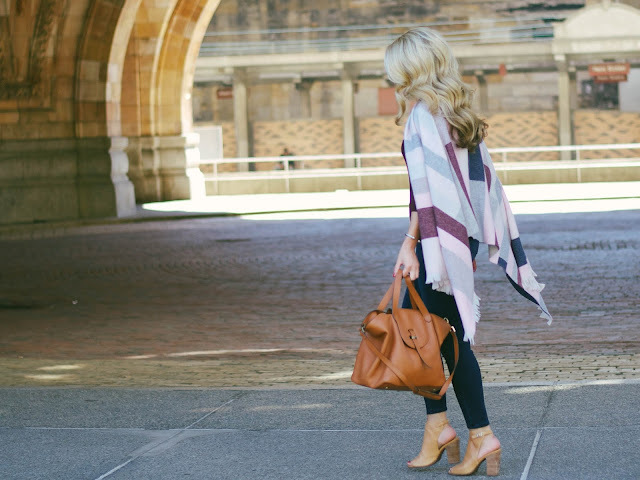 Today I have styled the wrap for a weekend out and about. 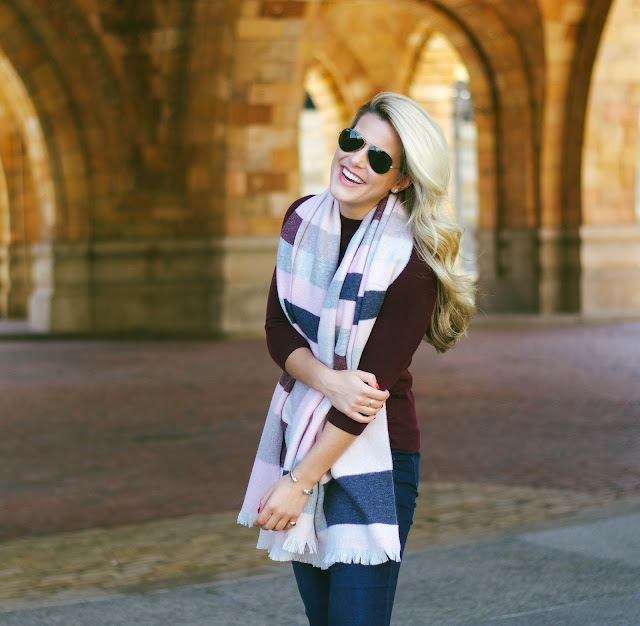 The scarf is under $100 and is woven in gorgeous shades of pink and then also has pops of navy and burgundy, too! It's 80% wool, and as you can see in the photos above, it's quite large, so it would be the perfect travel companion, too! It has started to get chilly here in Pittsburgh, so this is exactly the type of outfit you can find me in on the weekends. This cashmere sweater is one of my favorites. I have it in several colors and just love the way it fits. 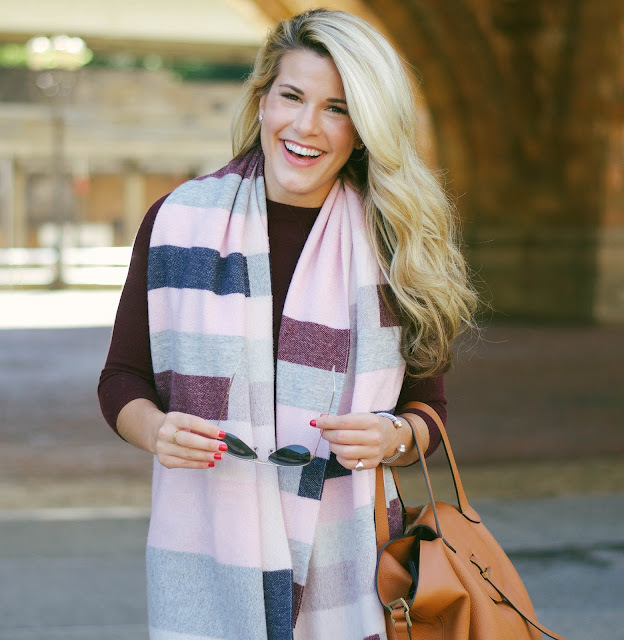 It's great on its own, but also is the perfect piece for layering since it is not bulky! The jeans I am wearing are amazing-- seriously, I had no idea that these existed and am SO glad to have a pair now. They're stretchy and beyond comfortable, but not too much of a legging that it looks like you're not wearing actual jeans. The fit is wonderful and the waist is high, but not too high-- perfect for tucking in or letting your shirt hang loose! I am wearing a size 4p. I would have never chosen a petite, because at 5'6", I've never been considered 'petite', but I just love the fit and length on the petite size much better. Also, if you are in-between sizes, I'd suggest sizing down as they are very stretchy-- I really liked the size 2 fit the best, but it was out of stock when I went into the store! I have never been a fan of red and have very little of the color in my wardrobe. 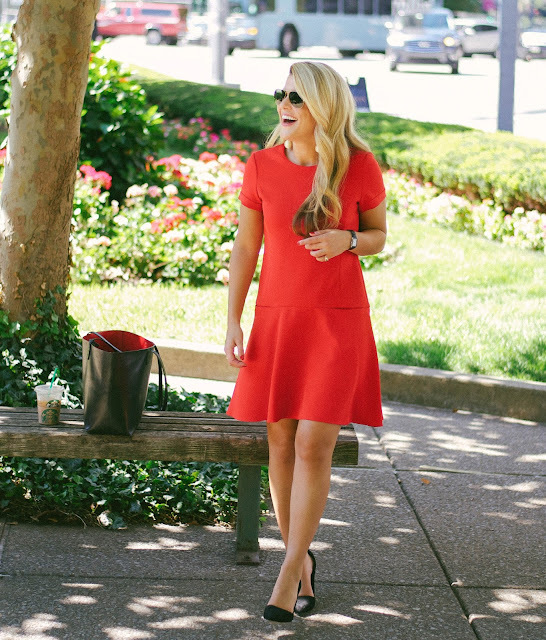 However, recently, I've been drawn to the color and picking out pieces in various shades of red to add to my closet. This gorgeous drop waist a-line dress is one of my newest red additions. It fits like a dream and the quality for the price could not be better! I styled it in a wear-now way but added a car coat overtop in one of the photos to show you how it can easily be transitioned as the temps cool down-- which they are in Pittsburgh (finally!). The best part about this dress? 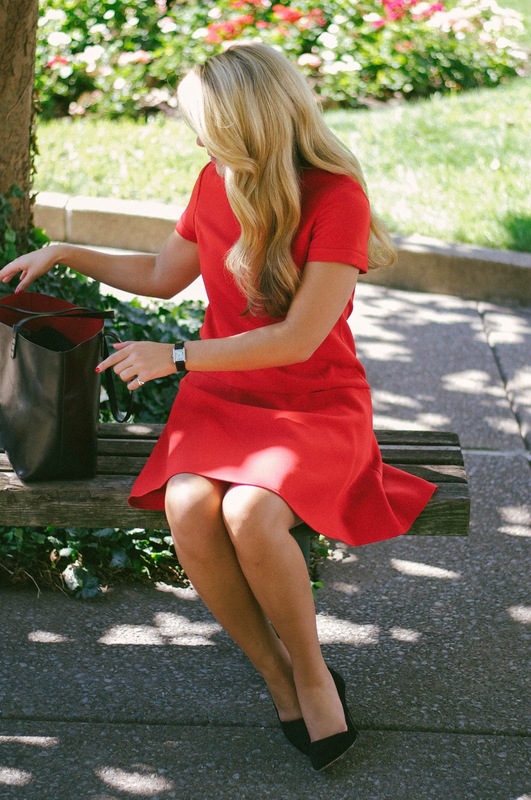 It's cut in a style and fabric (crepe) that can be worn for almost any occasion. From work to cocktail parties and anything in between, this is appropriate for everything! This weekend is jam packed with fun things! Last night I went to Thrival Festival which had the Chainsmokers as the headline (plus Chvrches and Daya!) and tonight I am doing the party peddler again. My dad is still best friends with all of his friends from high school, so we have grown up with their families for our entire lives. We vacation together, go out to dinner, celebrate holidays together, etc. So now the 'children' are all good friends. We are doing the party peddler to celebrate one of the dad's birthdays and so it will be the 'adults' and the 'kids' partying together. I can't wait! Not to mention, there's a Hunter Hayes concert at PNC Park after the game that I am going to try and make it to, too! I've been all over the place this week with things I am loving. From way-too-expensive handbags to affordable sweaters, I've found something I love in all categories! 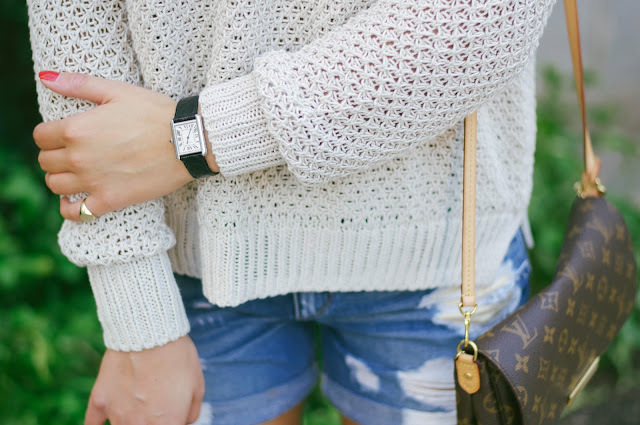 There are few outfits better than shorts with a sweater/sweatshirt, right? It's my all-time favorite. Casual, cozy, easy. This time of year I get a lot of wear out of this type of outfit. 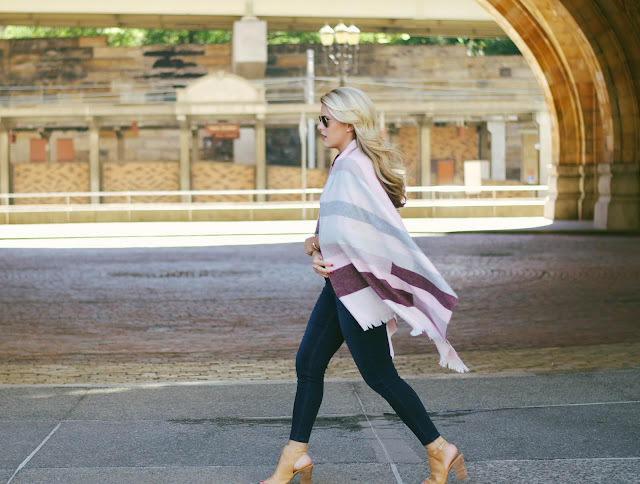 It's the perfect thing for cool mornings and nights. which is something that we see a lot of here in Pittsburgh. I have a lot of sweaters that are very similar to this. 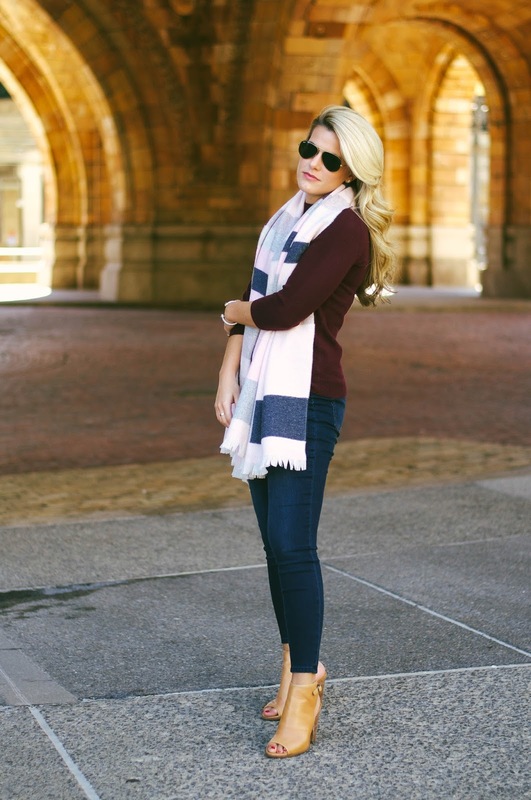 There's just something I love about a slouchy crewneck sweater with an airy weave! 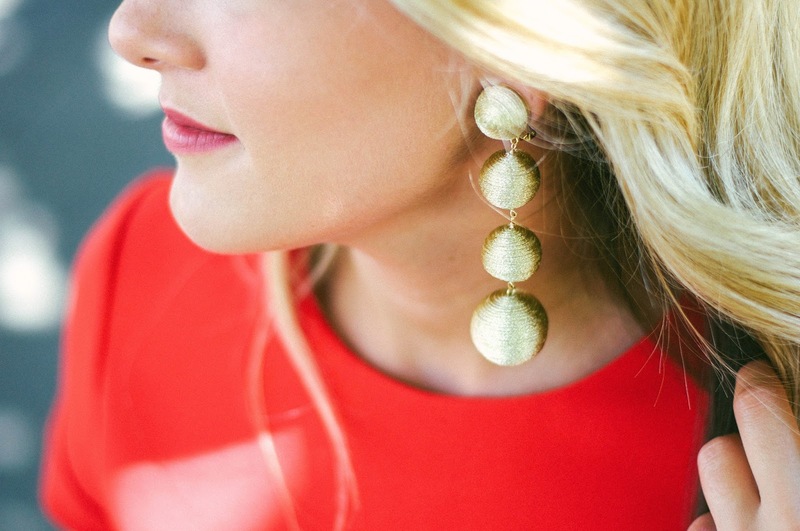 It pairs easily with shorts, jeans, and even skirts. I also love this style of top under vests. These shorts are one of the most worn things in my closet. Unfortunately, the exact style is sold out, but I found similar pairs here and here. I wore this outfit for a day around the city with my sister. Our first stop was Starbucks for our first pumpkin spice latte of the season. We always order the PSL with skim milk and just 1 pump of pumpkin spice syrup. It majorly cuts down on the calories and I think it tastes much better, too! Reading: I just got The Couple Next Door and started it this week. I can hardly put it down, it's so good! If you like suspense, this is definitely the book for you. Wearing: I have a full blog post on this sweater to come, but it might be the coziest thing I've ever owned. It comes in 3 colors, I got it in the heather root shade. It is under $100 (which is a good price for the knit composition because it has 10% alpaca!) and fits roomy, but I still got a small. I want to go back and get the other two colors, I love it that much. 1// Sophia Vergara Talks about Joe Manganiello's Steeler obsession. Pretty freaking cool-- also, he went to my high school! 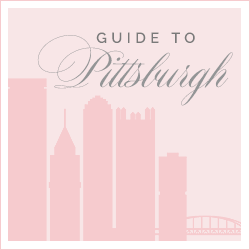 2// The Telegraph published an article titled 'How Pittsburgh Became America's Most Unlikely Cultural Capital'. 3// I don't really watch TV, but NBC just aired a show called This Is Us which is set in Pittsburgh. So therefore, I had to watch it. The show literally opens up with Milo Ventimiglia (you know Jess, from Gilmore Girls?!) practically naked except for a Terrible Towel covering him. Awesome. The first episode was really good and I can't wait to watch the next! Wanting: I came across wayyyyy too much this week. I really had to practice self-control! Watching: Alanis Morrisette and James Corden rework 'Ironic' in terms of today's pop culture. It's hilarious. Eating: I just got a crock pot...which is making me feel really 'adult', so if any of you have any really good recipes, send them my way! Smelling: You guys. I got a sample of this in my Nordstrom order and it is the BEST SCENT EVER. Seriously. It's woody and warm but also light and fresh at the same time. Very hard to describe, but this is 100% my scent for 2017. Drinking: I love trying out Nespresso pods. I just got the new limited edition tinto de Columbia pods and they're so good! 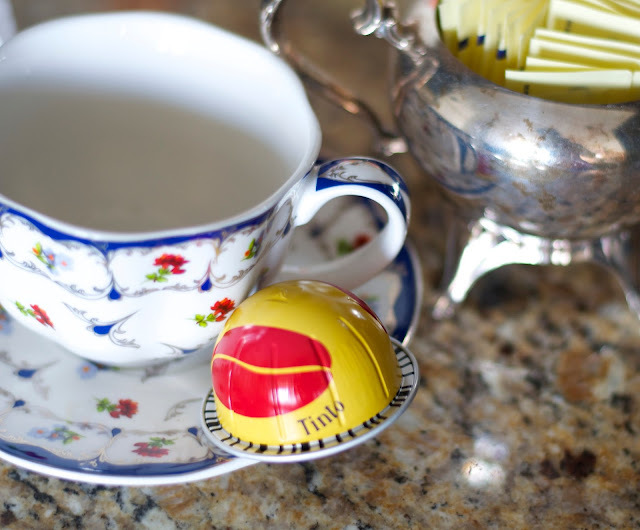 They're a lighter roast so they're perfect for an afternoon cup! Drinking II: These Barefoot Sprtizers have been a total crowd pleaser as of late. It's definitely something to keep on hand for guests and they're so perfect for tailgates! Listening: I came across this cover of the Chainsmoker's Closer and I love it! This song never gets old and this cover by Walk Off the Earth just makes it all the better! If you didn't know, I am obsessed with the Chainsmokers-- I saw them in concert last year and am SO excited to see them again tomorrow! If you're not familiar with Walk Off the Earth, my favorite song by them is Red Hands. I also had no idea that they do a ton of covers on their YouTube channel and they're all amazing. I really like Let It Go, Teenage Dirtbag (this brings me back to middle school), and Hello. Decorating: If you saw last week's post and wanted to place a frame order with Framebridge, you're in luck! They have graciously given me a code for Summer Wind readers to save 15% on your first Framebridge purchase. Use code SUMMERWIND15 at checkout! Quoting: 'I remember riding in a taxi one afternoon between very tall buildings under a mauve and rosy sky; I began to bawl because I had everything I wanted and knew I would never be so happy again.' - F. Scott Fitzgerald// See more of my favorites here.